The SCADE Suite Modeler includes the SCADE Suite Editor, the SCADE Suite API for Eclipse, and the SCADE Suite Configuration Management Gateway. intuitive graphical notation based on unlimited nesting of data flows and state machines. Include module libraries that simplify intricate operations and manipulations. SCADE Suite comes with all of the basic library operators needed to create specifications. 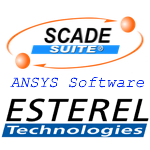 SCADE Suite integrates the Java-based Eclipse Applications Programming Interface (API) in compliance with the Eclipse Modeling Framework (EMF). The Configuration Management Gateway allows integration of SCADE Suite models in a configuration management environment such as IBM Rational Synergy(tm), IBM Rational ClearCase(r), Serena Dimension CM, MERANT PVCS(r), CVS, or Visual Source Safe(tm). SCADE Suite Modeler also features a tight integration with SCADE Display, enabling co-design, co-simulation, co-reporting and co-generation of DO-178C up to Level A certifiable code.